Did Israel Provoke Increase in Rockets to Justify Operation Cast Lead? 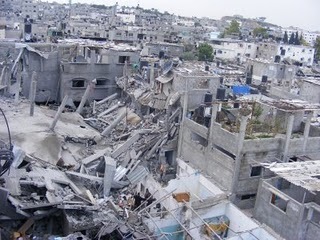 Prior to Operation Cast Lead, the devastating Israeli attack on Gaza in 2008-09, there had been six months of a truce which both sides claimed the other did not maintain in good faith. Still, the truce endured. When Israel escalated the tensions on November 4, 2008, killing six Hamas men in an operation Israel said was meant to thwart a tunnel Hamas was building to abduct more Israeli soldiers, some people felt that Israel was intentionally raising the stakes because the truce was holding and Hamas was fortifying its position in Gaza. Destroyed buildings in the the Bau'lusha family's neighborhood. Picture: B'Tselem. Therefore, the thinking went, Israel struck hard at Hamas with an excuse knowing that Hamas would feel it had no choice but to retaliate.